I recently bought an oven. It’s not my first in China, but the first since moving to Haikou and first since I began delving deeper into cookery as a hobby. Despite it essentially being an over-confident toaster, the oven has allowed me to expand what I can make here at home considerably. Home-cooking and baking has always been a bit of a novelty to me; but living in China, with its limited access to things we take for granted back in Canada, it opens up a world of food that is otherwise cut off by the cultural and geographical divide. 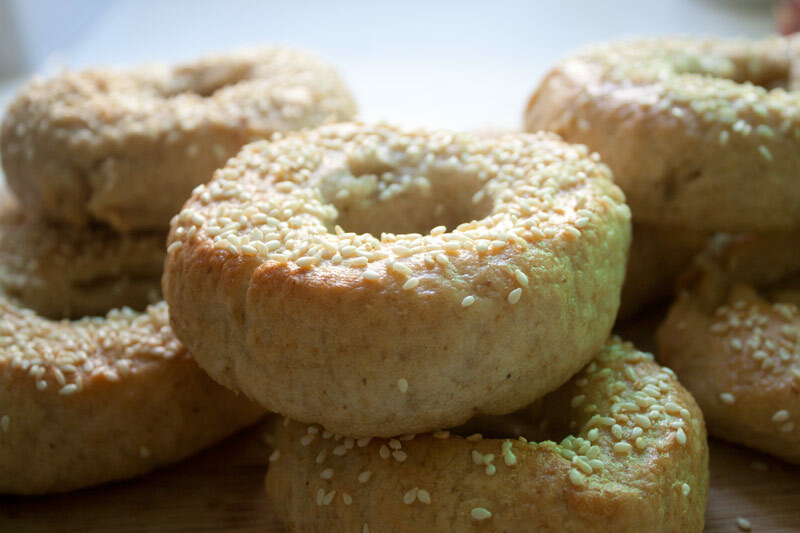 One such item that has not found its way into Chinese bakeries is the bagel. Oh, what I would give to be able to go down to the supermarket and grab a 6-pack of everything bagels and a pack of cream cheese to smother them with. A breakfast bagel is always my first morning meal when I go home for a visit, and has been a constant point of disappointment for me here upon ordering ring-shaped bread in hopes that it actually is “a bagel” as the Chinese label professes. * I used regular whole-wheat flour, as I did’t have any bread flour. The bagels stilled turned out good, but I think the next time I make them I’ll use half whole-wheat and half all-purpose, as they were a bit heavy. ** I didn’t have malt syrup, so instead used 1.5 tbsp of sugar. This is for the boiling step, and is not to be mixed into the dough. *** Likewise, this is not for mixing into the dough — but should be beat with a bit of water and used as a wash on the top of the bagel so that seasonings stick (optional). Shamefully, I was out of eggs when the urge to bake hit, and so used milk for my wash instead – worked just fine. Combine all dry ingredients (flour, yeast, sugar and salt) and mix well with a wooden spoon or your hands. When all dry ingredients are well mixed, make a small well in the middle and slowly start adding the water. Using your hands or a spoon mix in the water until fully incorporated. Turn out the dough onto a lightly floured surface and kneed dough until smooth and somewhat elastic (5-8 minutes). Put dough in a lightly oiled bowl to stop it from sticking, cover with damp towel or plastic wrap for 1 hour or until doubled in size. Turn dough back out onto lightly floured surface, and divide into 10 equal portions. Roll portions into a ball and poke a whole in the middle with your finger, slowly work the dough so it is an even bagel-shape. Make the whole just slightly larger than you’d want it in the finished product. Place on tray, cover and let rest for about 10 more minutes. While the bagels are resting, fill a large pot or deep pan with 5-6L of water, add malt syrup (or sugar) and bring to boil. Get your oven pre-heated to 200°C. Add several bagels to the boiling water (don’t crowd). They’ll sink and then float to the top. Flip after 30 seconds and boil an additional 30 seconds. Place boiled bagels on a rack. Pat dry. Brush on egg wash and sprinkle on your toppings — sesame seeds, poppy seeds, salt, whatever. Place bagels on lightly-greased baking sheet and bake in oven for 30 minutes*. * Check bagels at the 20 minute mark. If the tops are browner than the bottoms, flip. If about equal, let top get a bit darker. It’s tough to be spot on with baking times when it comes to a little oven like the one I have. 30 to 35 minutes should do it though. See all Food & Drink, Home Cooked posts. Tagged: bagels, baking, cookery, cooking, foods from home. They look like they turned out well, though I have to take your word for the taste. Looks like you got a great start with the oven. Keep the recipes coming. They were a bit too chewy for my tastes, but it’s since been suggested that instead of 30-sec per side, I boil them 15-sec per side. Also I will switch to 50/50 whole-wheat and all-purpose flour next time to make them a bit lighter. As for the attraction — just damn yummy my friend. You need to find yourself a good bagel, toast it up and smother it in something spreadable. And the hole — I assume that’s to aid in complete cooking. A proper bagel should be like Dwarf Bread… just soft enough that you don’t break your teeth. Please please please please please please please please please…..
Lol, not sure they’d live up to your high standards. Right now I’m just trying to track down yeast to make some more (I know.. yeast? But both Nanguo and Carrefour were completely out).